Love your slow cooker but stuck in a rut with the same old recipes? It’s time to create your own. This post will show you how to build your own slow cooker recipes with the same ease and convenience you’re used to. The possibilities for variation are endless, meaning your taste buds will never be bored again. Even if you’re not bored with your slow cooker standbys, assembling your own recipes is a good way to clean out your pantry or refrigerator. Many Americans depend on their slow cookers to put dinner on the table. Sales have doubled in the last fifteen years, in part because men are using the iconic appliance to make meals for Sunday football, and the Internet is brimming with recipes that will allow anyone armed with a slow cooker to create a wide array of meals. 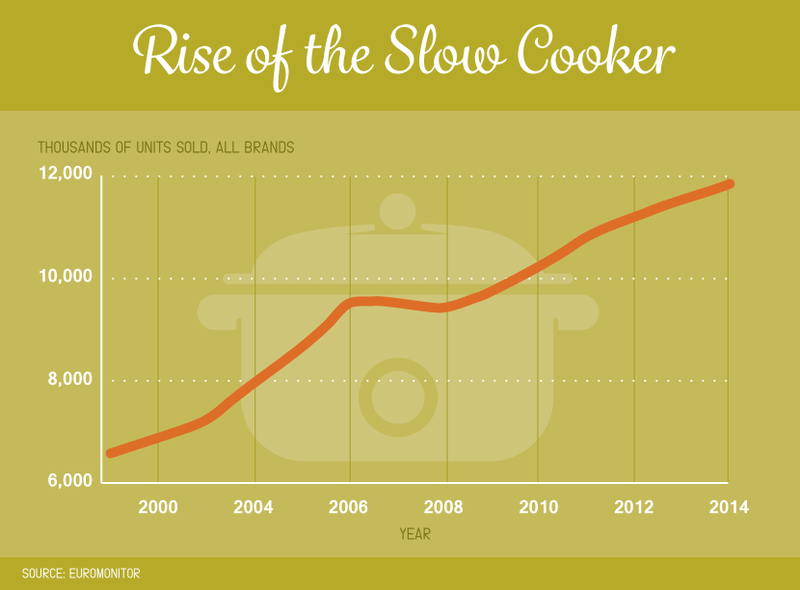 Even so, slow cookers are still the kitchen staple people love to hate. Maybe you had one mushy outcome and banished your slow cooker to the basement. Or you associate it with your Aunt Martha’s unimaginative stews. Whether you love it or hate it, or have yet to try it, find inspiration and cooking tips in these ideas for building your recipes. A jar of marinara sauce will taste great with just about anything else you add to the slow cooker, from meats to beans and veggies. If you don’t have pasta sauce on hand, look through your cupboards for what you do have. Maybe you bought a curry sauce at Trader Joe’s that seemed versatile at the time, but is now collecting dust. This is a good time to use up sauces and marinades you haven’t found any other use for. It’s also a great opportunity to use up leftovers from your refrigerator. Do you have soup or another sauce-based dish sitting around? Throw it in, add a few more items from the next section, and you’ll have a brand-new recipe. 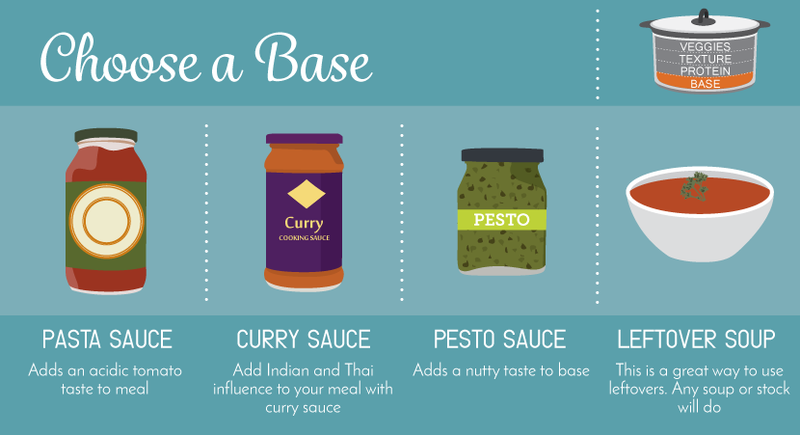 If you don’t have much in your kitchen or don’t feel inspired by your choices, buy or make a base sauce. You can go Italian with a pesto, Alfredo, or other pasta sauce, or look for curry sauces with Thai or Indian flavoring. If you want to make meat or fish in your slow cooker, the cooking time will vary according to what you choose. Pork cooks the longest, from 5 to 9 hours depending on its weight and your choice of a high or low heat setting. Poultry should stay in the slow cooker for 6.5 hours on high heat, 7.5 on low. Beef will need 5.75 hours on high heat and 8 hours on low. Fish doesn’t need to be cooked very long – just 1.5 hours on high heat and 3.5 hours on low. 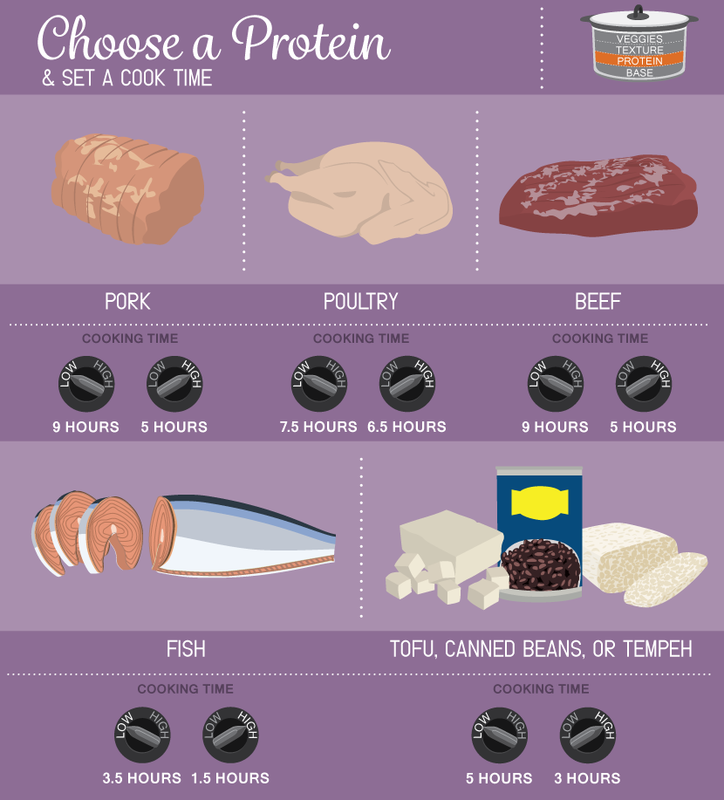 If you choose a vegetarian protein such as tofu, tempeh, seitan, or canned beans, you’ll have some flexibility with cooking time. 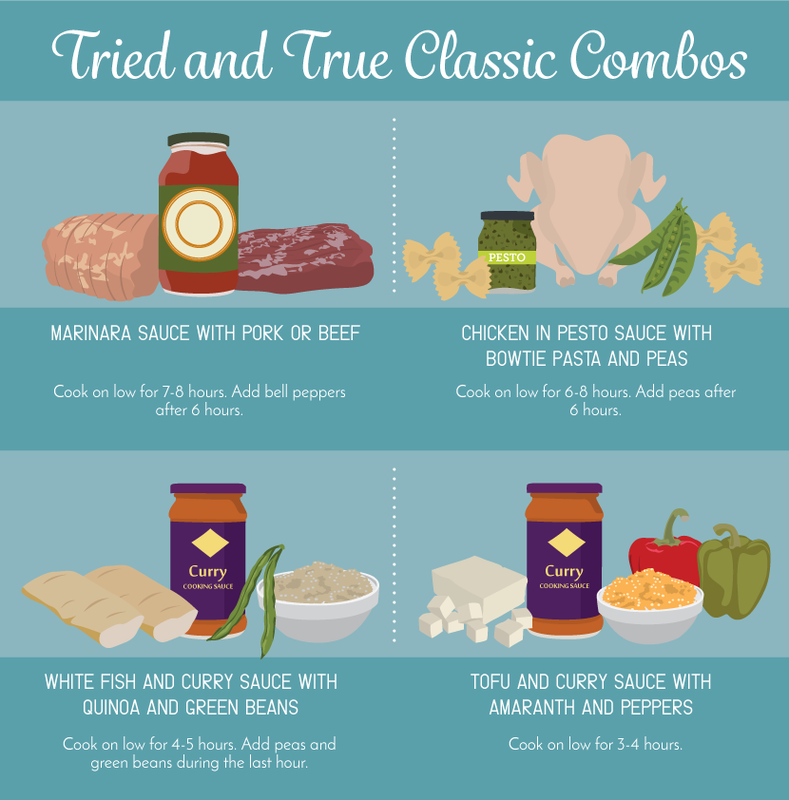 In general, these options don’t need to cook as long as meats and fish, but they become more flavorful the longer they marinate in sauce. Here’s a money-saving tip: substitute dried beans for canned. Just soak them overnight in water, then cook them for 3 to 4 hours in your base sauce. Dress up your dish with pasta in fun shapes such as wheels or bowties. Penne and other small pastas will also work well. To avoid mushy pasta, add it close to the end of the cooking cycle, about 18 to 30 minutes beforehand, depending on the kind of pasta. It will also help to transfer the contents of the crock to a serving bowl as soon as it’s done cooking. Rice is another slow cooker favorite. Go with brown rice instead of white for more nutritional benefits. Depending on the kind of rice you choose and the heat setting, you should add it with about 2 to 3 hours left. You may also need to add hot water if there isn’t enough liquid to meet rice’s 2:1 cooking ratio. Expand your horizons with other healthy grains, including barley, bulgar, millet, quinoa, and amaranth. The last two are complete proteins, which is good for everyone but especially beneficial to vegetarians. As with rice, they should be added near the end of the cooking cycle, with exact times depending on the type of grain and the slow cooker’s setting. 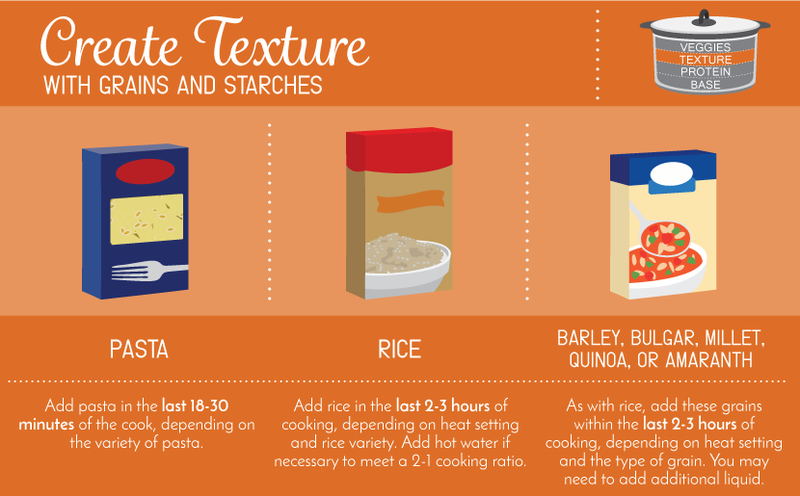 If you are adding grains or starches, be sure to remove your recipe to a serving dish promptly at the end of the cooking cycle to avoid overcooking. 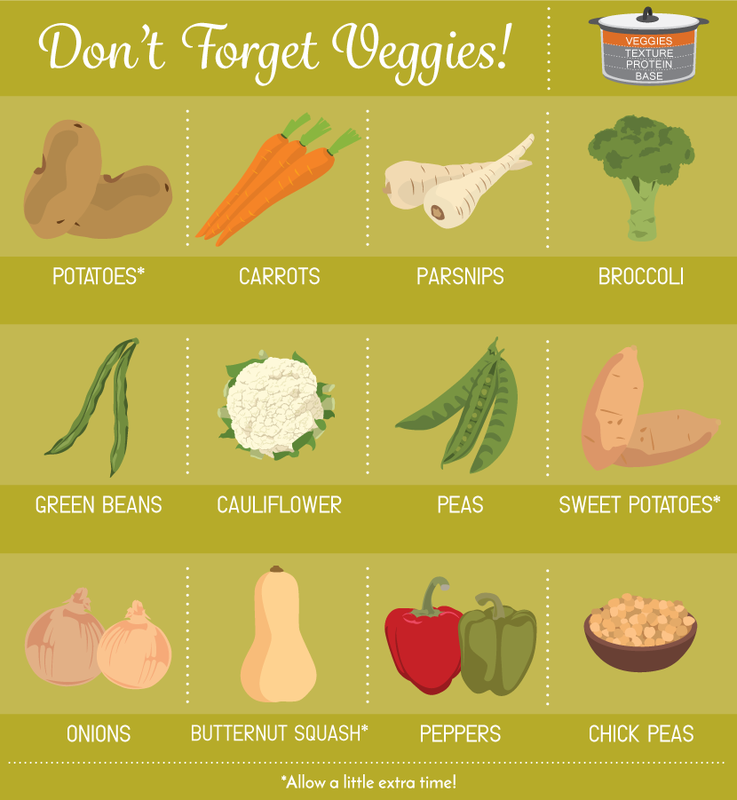 Add as many vegetables as you want to – you can’t go wrong. Shop the farmer’s market to eat seasonally or use up that half-empty bag of peas in your freezer. Just make sure you thaw any frozen foods before adding them. Vegetables can also suffer from overcooking, so wait until the last 30 to 60 minutes of the cooking cycle to add them. Firmer veggies such as potatoes and carrots will need to cook longer, whereas peas and other small veggies can go in at the very end. Just before serving, top off your meal with shredded cheese, green onion, bread crumbs, tortilla strips, or any other yummy topping you have on hand. Now you see that the possibilities for building your own slow cooker recipes really are endless. Overwhelmed by choice? Embrace it! Alternate between making tried and true recipes and experimenting with your own. A slow cooked supper is never a bad option!